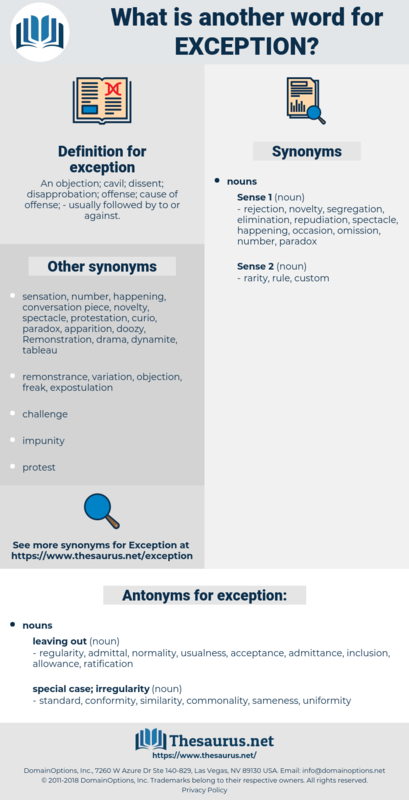 What is another word for exception? An objection; cavil; dissent; disapprobation; offense; cause of offense; - usually followed by to or against. deviations, departures, Motions, Disparities, mistakes, defects, reservists, objection, exclusion, exclusions, emergency. 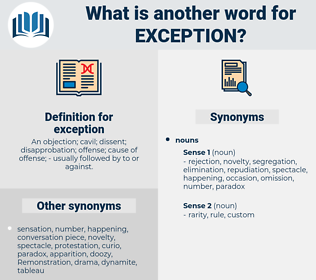 Bis, opt-out, distinction, deviation, disqualification, 'exclusion, exceptional, non-application, limitation, restriction, proviso, caveat, objection, one-off, Unless, departure, exclusion, qualification, exoneration, emergency. regularity, admittal, normality, usualness, acceptance, admittance, inclusion, allowance, ratification. standard, conformity, similarity, commonality, sameness, uniformity. ordinary, approval, usual, acquiescence, sanction, willingness, agreement, compliance, norm, assent, obedience. No such exception was made in the bill. A dinner with the Emperor was always delightful to Betsy and Jane, and this one was no exception. exhibition, Egyptian Onion, expiation, expatiation, expedition, egyptian, excavation. omission, representative, instance, illustration, example.